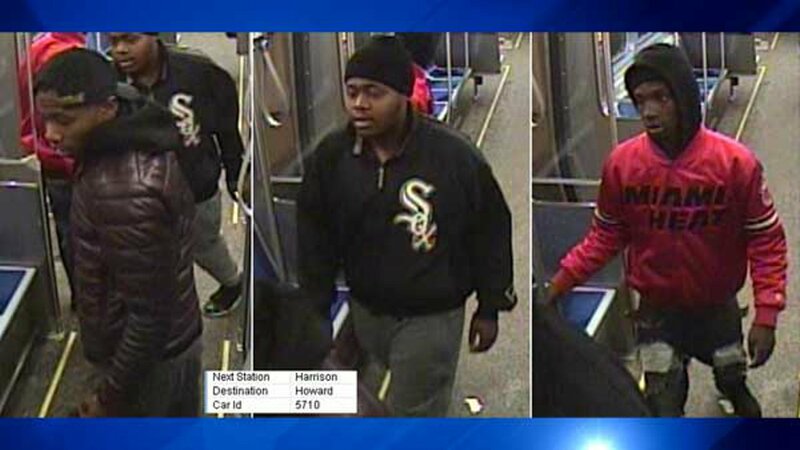 CHICAGO (WLS) -- Police asked the public to help identify three men who robbed a CTA Red Line passenger at the Sox-35th Street station last week. Surveillance shows the three suspects walked up to a rider sitting alone on a Red Line train around 1 a.m. on Dec. 12. Police said they hit the victim and stole property before running off the train. Police released a vague description of the suspects. Surveillance photos show one man was wearing a black baseball cap, a black hooded sweatshirt and a dark-colored puffy jacket. Another man was wearing a black knit hat and a black jacket or sweatshirt with a Chicago White Sox logo on it. A third man was wearing a black knit hat under a dark-colored hooded black sweatshirt under a red jacket that said Miami Heat on it. Anyone who can identify the suspects or has information pertinent to the investigation should call Area Central detectives at 312-747-8382.